Welcome to Branch & Vine Handmade! My name is Jen and I live in beautiful Northwest Washington with my husband and two children. I am a home-based sewist who lovingly creates custom quilts, bags, clothing, gifts, and more. Thanks for sharing in my creative journey. It all started with a hand-me-down sewing machine. My grandmother was a quilter, but degenerating eyesight kept her from being able to sew. I had just given birth to my second child and had recently ended my part-time employment outside the home to face the new challenges of caring for two young kiddos. Although both my mother and grandmother sewed, I never really took much interest. I was more of a sporty, active girl and didn't consider myself creative or artistic... at all. My best friend sewed the most amazing bags, clothes, etc. and I felt inspired and encouraged by her to give sewing a try now that I was confined... oops, I mean... spending more time at home. To my surprise, I LOVED it. A few months into my sewing journey I took a quilting class at my local quilt shop and was truly hooked. I found that I was creative and probably had been all along; I just hadn't discovered my medium until now. I don't work in paints or charcoals... I work in fabric! I love experimenting with color, shape, pattern, and scale. I love the graphic nature of quilting and the juxtaposition of artistic design in useful, everyday items. Art that you can wrap yourself up in with a book and a coffee? Yes, please! Six years after my first stitch, I decided I was ready to share my work on a larger scale, both digitally and tangibly. With much encouragement from family and the best friend who first inspired me, Branch & Vine Handmade was born. To enjoy goods from Branch & Vine Handmade in your home, you can visit my Etsy shop or contact me to request a custom piece. Here I share my creative journey, and I hope you will join me. All my work is lovingly sewn in my home on my domestic machine (her name is Greta) in a pet- and smoke-free environment. Quilts are made mostly from 100% quilting cottons, but in some quilts I also incorporate other substrates like voile, chambray, or linen. 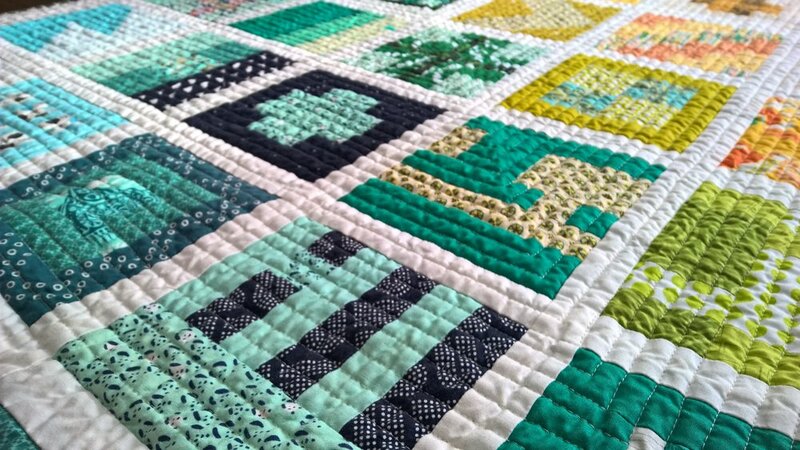 All quilts are machine washed and dried before shipping to ensure your product will not experience additional shrinkage or color bleed in your home. To care for quilts, machine wash warm and tumble dry on low to medium heat. Specific care instructions for purses and bags will be included with your item.